Simão Francisco from Portugal will be a guest conductor for “An Iberian Celebration,” an evening of Spanish and Portuguese music. This concert will be at 7:30 p.m., Monday, April 15, in the Anne R. Belk Theater of Robinson Hall. Tickets are $8. An accomplished flutist and conductor, Francisco is chief conductor of the Wind Orchestra of Médio Tejo, the Symphony Orchestra Thomar, the Wind Orchestra of Covilhã, the Wind Camerata Fernando Lopes-Graça and the Philharmonic SAMP-Pousos/Leiria, all in Portugal. He has been featured as a flute soloist throughout Europe and performed with numerous orchestras. The April 15 program includes works by four contemporary composers from the Iberian Peninsula. “Fanfare Overture” is by Lino Guerreiro (born 1977), a Portuguese composer who writes primarily for winds and percussion. “Concertino for Trumpet,” by Portuguese composer and saxophonist Nelson Jesus (born 1986), will feature UNC Charlotte trumpet professor Eric Millard. 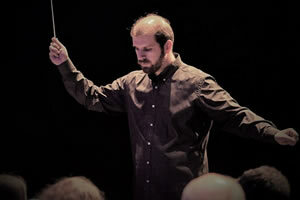 UNC Charlotte Director of Bands Shawn Smith will serve as narrator for “Finis Mundi” (The World's End) by Spanish composer José Ignacio Blesa-Lull (born 1984). Like Jesus, Blesa-Lull has won many composition contests with his works for wind band. The program will conclude with Jorge Salgueiro’s “First Suite for Band.” Born in Palmela, Portugal, in 1969, Salgueiro has composed more than 270 works, including symphonies, operas and music for theater, ballet and film. He is associate conductor for the Lisbon Philharmonic.